The Islamic Republic of Iran is taking up where the Gulf Cooperation Council (GCC) left in Jordan. The GCC proposed in 2011 to invite Jordan (and Morocco) into the regional club. No further development has taken place since and there are no signs any progress has been made or whether the initiative has any traction left at all. More recently, when protests erupted in Amman against a cut in fuel subsidies, the six GCC partners indicated they would come to Jordan’s rescue with financial assistance. The regional club is seemingly still studying ways to reduce the kingdom’s budget deficit. Iran has swiftly stepped into the breach. 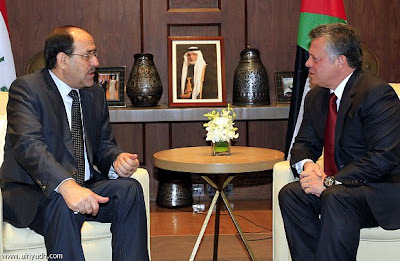 A month after the Iranians started courting Jordan overtly, their surrogate in Iraq, Prime Minister Nouri el-Maliki, flew to Amman on Monday to offer of a lifeline to the Jordanian economy. On November 21, Iran’s ambassador to Jordan, Dr. Mostafa Moslehzadeh, said in a televised debate Tehran is ready to supply Jordan with oil and energy for the next 30 years in exchange for Jordanian goods and “religious tourism” to Shiite shrines in the kingdom (see my post, “Iran on charm offensive in Gaza and Amman”). On Monday, December 24, Maliki said on conclusion of a fleeting visit to Amman that Iraq and Jordan have agreed to extend an oil pipeline to the Red Sea city of Aqaba for the export of Iraqi crude. The new pipeline would have a one million barrels daily capacity. Iraq also agreed to “bring into effect a 2009 agreement to establish a free trade zone between the two countries” and double monthly heavy fuel exports to Jordan to 60,000 tons. There was also talk about Iraq boosting its crude oil shipments to resource-poor Jordan from 10,000 to 15,000 barrels a day at well below the global market value. Maliki's Shiite-led government announced earlier a one-time gift of 100,000 barrels of crude to help Sunni Muslim Jordan face an energy-related budget crisis. Violent protests erupted in Jordan last month after the government removed subsidies to offset $5 billion in losses from a rising fuel bill. Heating and cooking gas prices jumped by 54 percent, and some oil derivatives rose by up to 28 percent. Ensour and Maliki signed the minutes of the Joint Jordanian-Iraqi Higher Committee meetings, which undertook to foster cooperation in trade, transport, energy and investment and to grant six-month multiple entry visas to drivers of trucks and vehicles transporting passengers and cargo between the two neighbors. "We need each other; Jordan is important for Iraq in trade… and at the same time, we need the Iraqi market as a target and a route to access Turkish and European markets," Ensour told reporters at a joint press conference with Maliki. He said the Iraqi market would prop up the export of local agricultural produce, which has been hit by the Syria war.